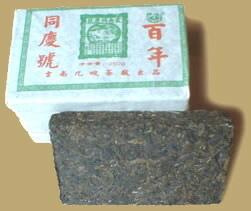 Tongqinghao Tea Court established tea factory in Yiwu since 1736. In years of war, change a dynasty and upheaval during which the tea factory changed hand time after time. Today, Jiuwan factory produced the tea according traditional processing method of that day, it is the beginning of a new world of Pu-erh tea for you.